TPU writes SilverStone's Kublai KL04 mid-tower case will start shipping on January 24th for 82.90EUR (excl. VAT). For next week SilverStone has planned the retail arrival of its newest Kublai Series PC case, a mid-tower called KL04 which features a steel body and is able to house four 5.25" drives, as well as nine 3.5" and up to six 2.5" drives (just like the Temjin TJ04-E launched last week). 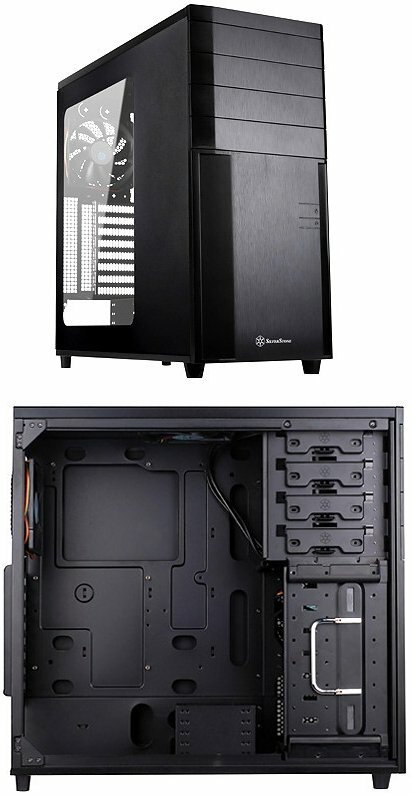 SilverStone's chassis measures 214 (W) x 489 (H) x 499 (D) mm, it weights 8.2 kg, and has a black paint job both inside and out, a front I/O panel with USB 3.0 (x 2), MIC and Audio ports, eight PCI slots, tool-free mounting on the 5.25" bays, and three built-in 120 mm fans, one on the right side, one on top and one at the rear (all three work at 1200 RPM and have a sound output of 21 dBA). The Kublai KL04 will be available with and without case window.